The undersea robotic glider used by researchers at Oregon State University deftly maneuvers through Oregon's rough waters, which are famous for their high waves, fast currents, uneven sea bottoms, and rocky outcrops. The glider's rudder steers the vessel via GPS coordinates. A pinger on the glider's tip uses sonar technology to help the glider avoid rocks, canyon walls, and other subsurface obstructions. Every summer since 2002, Oregon's coastal waters have been invaded by massive low-oxygen zones, commonly known as "dead zones," that become so oxygen-starved that most animals flee, die or suffer severe stress. In order to determine how and why these dead zones form, scientists must continually monitor conditions in affected waters, which may cover hundreds or even thousands of square miles. But how can scientists possibly wrap their monitoring instruments around such huge swaths of the sea? Not by relying solely on traditional instruments, which are deployed by ships and crews at a cost of $20,000 per day, need favorable weather conditions, and can only operate for limited time periods at a stretch. To overcome the shortcomings of traditional instruments, a research team co-led by Jack Barth and Kipp Shearman of Oregon State University (OSU) and funded by the National Science Foundation has been deploying unmanned robotic gliders throughout Oregon's coastal waters since 2006. Each of these gliders is programmed to patrol the seas nonstop on its own for up to three weeks at a time—all the while measuring the water's oxygen concentration, temperature, salinity, density, chlorophyll content, and other variables that reflect its ecological health. 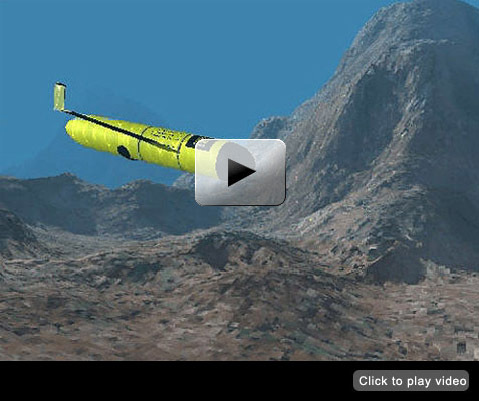 Each glider may dive down to maximum depths of 200 meters below the surface. But "every six hours, each glider must pop back up to the surface and call in to a computer at our lab via satellite phone and send home the data," says Barth. By providing around-the-clock, real-time data on subsurface ocean properties that would otherwise be unobtainable, "OSU's gliders are opening up a whole new window on the world beneath the ocean surface, just as satellites opened up a whole new window on the ocean's surface years ago," says Barth. Covering about a half a nautical mile per hour (0.5 knots), each OSU glider takes about five days to travel a 45 mile transect offshore and back. So far, OSU's fleet of gliders has cumulatively travelled more than 25,000 horizontal kilometers, which is equal to travelling about 70 percent of the way around the globe. Built at a total cost of about $100,000, each glider saves more than $300,000 over traditional monitoring equipment in a three week research session. Plus, "the gliders never get tired or seasick," says Barth. And they deftly maneuver through Oregon's coastal waters, despite the high waves, fast currents, uneven sea bottoms, and rocky outcrops. At any given time, the OSU team may have up to four gliders patrolling Oregon's coastal waters and an additional glider patrolling a dead zone located in Chile's coastal waters. The OSU team's gliders are among a small but growing number of gliders currently being used in marine research. How is the OSU team's glider-based research improving our understanding of Oregon's dead zones? For one thing, the gliders have helped the team document the existence, locations and dimensions of many low-oxygen zones, including a record-breaker that approached the Oregon coast in 2006; that dead zone covered more than 1,158 square miles—about the size of Rhode Island. In addition, the OSU team's glider-based research is building on previous research on the causes of dead zones that was conducted by another research team co-led by Barth. 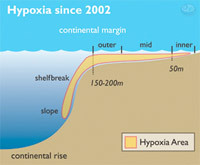 That research revealed that: 1) Oregon's coastal dead zones are formed by wind-driven upwellings of low-oxygen waters that naturally occur in deep, offshore waters; and 2) these low-oxygen waters may be expanding towards shore because of changes in wind and oceanic circulation patterns. Barth suspects that these wind and circulation changes are, in turn, caused by climate change. Nevertheless, the relationship between climate change and Oregon's dead zones remains debatable. To more definitively nail down the immediate and underlying causes of Oregon's coastal dead zones, the OSU team will continue to use the gliders to track the movements and biological characteristics of low-oxygen waters in coming years. The team will then correlate resulting data with wind and circulation patterns and longer-term climatic changes. In addition, the OSU team hopes that its glider-based research will eventually help them generate something akin to underwater weather reports for Oregon's coastal waters. These reports would include predictions of whether, where and when dead zones would be expected to form each summer. Measuring about seven feet long, weighing about 100 pounds and painted a bright shade of yellow, each glider resembles a mini-torpedo. The OSU research team minimizes the chances of contact between the gliders and fishermen by keeping the gliders at depth and out of the paths of boats for most of their missions. In addition, the researchers have explained to local fishermen how to recognize the gliders, the importance of leaving the gliders in the water without interrupting their missions, and the benefits to all ocean users of their glider-based research. Each glider is equipped with two computers, several oceanographic sensors, communications equipment, and batteries for power. But rather than being driven by propellers that may only operate for a day or two at a time, the gliders are driven by buoyancy changes that require relatively little energy consumption: To rise, a glider expels water and thereby increases its buoyancy; conversely, to sink, a glider draws in water and thereby decreases its buoyancy. The glider's vertical motion is translated into forward motion by small wings on its sides. "Each glider operates much like a sailplane in the atmosphere," says Barth. "There will always be a need for ships in marine research," says Barth. "But there will come a time when gliders are deployed throughout the world's oceans because they are tremendously cost-efficient and can crank out critical data 24/7 that scientists need in order to address ecological problems ranging from climate change to dead zones. These gliders are indeed the future of marine research." 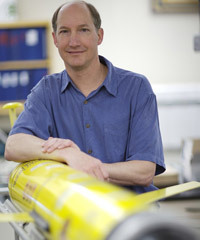 Jack Barth of Oregon State University (OSU) stands with an underwater robotic glider, which helps his research team collect round-the-clock, real-time data on water conditions, such as temperature, salinity, and oxygen levels. Dungeness crabs washed up on the beach at Cape Perpetua, Oregon, after suffocating in the low-oxygen waters of a dead zone in 2004. That dead zone generated miles of piles of dead crabs along Oregon's coast. 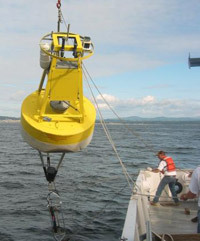 A researcher deploys a moored buoy that is used to detect and monitor changes in the ocean environment off Newport, Oregon. 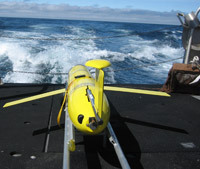 An Oregon State University (OSU) glider sits on the deck of Elakha, an OSU research vessel. Each glider may operate independently for up to about three weeks at a time, no matter how bad the weather may get.